Each year the IASWG Board honors an individual or individuals whom, over their lifetime, have made substantial contributions to group work and/or IASWG. The IASWG Board members vote to approve each IASWG Honoree during the symposium planning process. Local Symposium Planning Committee Honorees are chosen by the local symposium planning group members to honor those individuals or organizations, either from their own region or elsewhere, whom they believe deserve to be honored for their contributions to group work and/or IASWG. 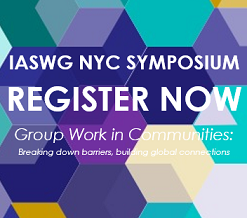 Created by consensus of the IASWG Board members in 2014, the IASWG International Scholar is a person invited by the IASWG Board to present at the annual symposium to provide special recognition to significant global issues at the annual symposium. Created by consensus of the IASWG Board members in 2014, the IASWG Diversity Fellow is a person invited by the IASWG Board to attend the annual symposium to ensure recognition of the importance of diversity in scholarship at the annual symposium. Each year, the IASWG Board solicits nominations and selects one or two outstanding BSW or MSW students (or new practitioners in the first 5 years of post-BSW/MSW practice), who show promise and dedication to IASWG and to the field of group work.